Stephen W. Terrell's (MUSIC) Web Log: TERRELL'S TUNEUP: HELLO, I'M JOHNNY CASH! Four years after his death, Johnny Cash is still rightfully being honored for his music. But his younger devotees might not be aware of his TV career in the late 1960s and early 1970s. Cash had a weekly variety show, broadcast live from the Ryman Auditorium in Nashville, which was the home of the Grand Ole Opry. Johnny would come out and sing songs along with his road troupe — wife June Carter Cash, Mother Maybelle Carter and the Carter Sisters, the Statler Brothers, Carl Perkins — and guest acts. By the mid-’70s, the variety-show format all but sank under the weight of raw tackiness — The Sonny and Cher Show, Donnie and Marie, The Captain and Tennille — and the form never recovered. But Johnny’s show was an exception; it featured some of the finest musicians — not only in country music but in rock, folk, and soul. Examples include Neil Young, Neil Diamond, Tammy Wynette, Stevie Wonder, Creedence Clearwater Revival, Ray Charles, George Jones, Derek & the Dominos, Bill Monroe, Jerry Lee Lewis, Conway Twitty, and The Everly Brothers (with their dad, Ike Everly). It was entertainment. But it was more. Indeed, it was. Cash used his 30-minute weekly show to bridge generational, cultural, and racial divides in a nonthreatening way during a turbulent time. Today it wouldn’t seem that radical or unusual to see a country singer like Cash team with a “folk rocker” like Bob Dylan. But believe me, in 1969 a large number of country fans equated rock musicians with dope-smoking, war-protesting, hippie weirdos (I can’t imagine why) — and rock fans equated country musicians with racist redneck warmongers. So it was a big deal when Dylan was the guest star on Cash’s first episode. Dylan sang a countryish tune called “I Threw It All Away,” then joined Cash for a duet on “Girl From the North Country,” (a song that the two had recorded for Dylan’s Nashville Skyline, which had only recently been released when the show aired). One of the finest performances here is Cash singing “Blue Yodel No. 9” with Louis Armstrong playing trumpet beside him. This was a conscious re-creation of the time Armstrong made a recording with country-music forefather Jimmie Rodgers in 1930. 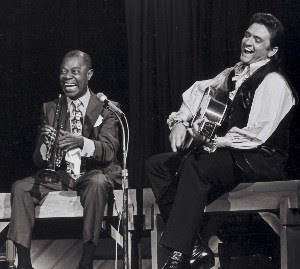 Cash recognized how remarkable the Satchmo/Singing Brakeman team-up was — an underrecognized and amazingly daring milestone of racial integration during the terrible era of Jim Crow. Singing the song with Armstrong on television was a sweet way to reaffirm the importance of that moment in American music history. But Cash also welcomed Pete Seeger. A few years earlier, Seeger had been forbidden to play on the network folk-music show Hootenanny because of his indictment for contempt of Congress — he refused to discuss his political affiliations during the McCarthy-era witch hunts of the ’50s. Neither Haggard nor Seeger sang political songs on the show (and no, they didn’t appear together, which would have been extremely revolutionary TV). But Cash wasn’t out to agitate. His goal was to find common ground. Still, Cash was not above preaching his social gospel. 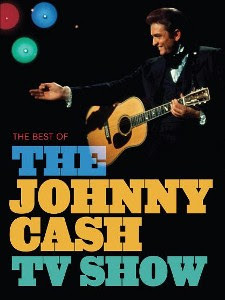 This DVD set includes a segment about the mistreatment of American Indians, including the song “As Long as the Grass Shall Grow,” a tune from Cash’s concept album about Indians, Bitter Tears. This was live TV, so the goofs weren’t edited out. Joni Mitchell blows the lyrics of “Long Black Veil,” but maintains her composure like a pro. Cash veers off course toward the end of “Man in Black” — which was the first time he sang the song in public — singing the end of one verse as if it were the end of the song, then catching himself and going on. But that doesn’t detract from the emotional punch of the tune. My only complaint with this compilation is that the show is interrupted just a little too frequently by people like Kris Kristofferson and Cash’s son talking about how important, groundbreaking, and special the show was. Not that it isn’t true, it’s just that the footage itself makes a better case. The Santa Fe Opry: Country music as the good Lord and Johnny Cash intended it to sound, with special guest Nancy Apple, all the way from Memphis: 10 p.m. Friday, Sept. 21, on KSFR-FM 90.7 FM and 101.1 FM. Terrell’s Sound World, free-form weirdo radio, same time, same station, this Sunday night, Sept 23.